Free FedEx Insured Shipping (Continenal US) Promo! Proven performance gains at a great price! This kit is designed by TMC Motorsports. It is a plug and play digital tuning kit for the FIAT 500 ABARTH. The kit is designed to increase the performance of the North American Model FIAT 500 ABARTH. 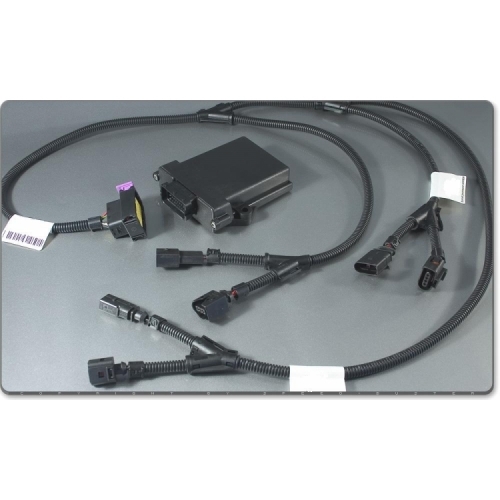 The second method is to use an external plug in Tuning Box or as some people refer to them 'Piggyback ECU', these units connect into the existing wiring of the vehicle generally using original manufacturers connectors, a control unit (Tuning Box) is then attached which can over-ride the signals coming from the engines sensors to the cars ECU and alter them to allow the injectors or common rail to inject more fuel at certain times and increase turbo pressure to keep the air/fuel ratio correct. Q. What kind of increase in performance can I expect from the TMC Motorsport Digital Tuning Unit and will it improve my M.P.G? A. The manufacturer (TMC) states that all of the units supplied by TMC Motorsport will give up to 40% increase in B.H.P and up to 30% increase in torque, the vehicle will be noticeably stronger pulling away and over-taking. All performance figures quoted are given as an approximate guideline and are provided by the manufacturer (TMC). They will vary from car to car, figures can also be influenced by outside factors such as temperature, air quality, quality of fuel and accuracy of the dyno the vehicle is being tested on as well as maintenance of the vehicle. On fuelling: the units are sold mainly for their performance increase however almost all customers who have fitted one have noticed that if driving sensibly M.P.G will increase by up to 20%, this is not due directly to the tuning unit but more to how the vehicle drives after the tuning unit is fitted, it’s really down to common sense, if the vehicle pulls away easier in lower revs you don’t need to keep changing gears as often which reduces the amount of fuel used. This also means that you do not have to rev the engine hard to get performance which reduces stress on the engine and again reduces fuel consumption. Q. Some ECU Modules (including TMC based Modules offered elsewhere) are encased in Metal Boxes, some are encased in Plastic Boxes. Which is better? The TMC ECU Modules we offer are encased in Plastic Boxes. These are the newest design and is superior to the older metal boxes available on some other modules. 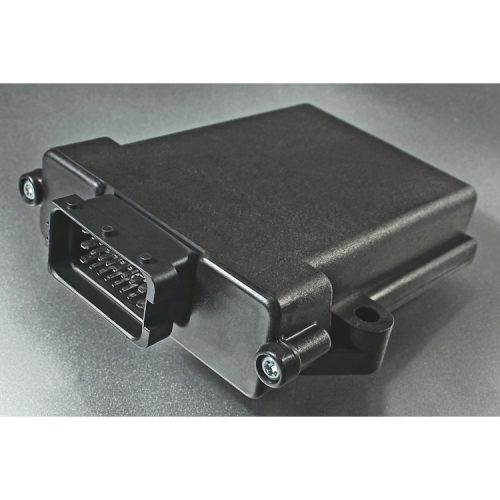 These TMC Modules have a specifically made, molded boxes that are fireproof and do a superior job in protecting the motherboard from moisture and heat. As you know it gets hot inside the engine bay of the 500. These boxes provide superior insulation to other handmade metal boxes. Q. 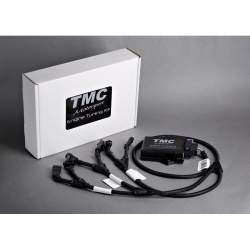 Why should I buy the TMC Motorsport Tuning Unit over others that are on the market? A. There are many good tuning kits available from various companies, but also many very bad ones which may cause serious damage to your engine leaving you out of pocket for hundreds or even thousands of dollars! The biggest difference between this tuning kit compared to many others on the market is that TMC uses multi-channel technology. These multi-channel kits also increase turbo pressure by adding more air with the additional fuel. 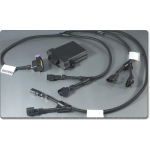 TMC Motorsport guarantees that their digital tuning modules are of the highest standards available, most units carry the highly regarded German T.U.V certification/approval and are rigorously tested and guaranteed for 3 years. A. It should not (per TMC). TMC units are specifically designed to run within the manufacturers’ safety limits and tolerances; the extra performance is easily within the capability of the engine and gearbox. The service intervals of the vehicle will not change however it is important that they be done on time and using original manufacturers parts, it is also very important to regularly check the engine oil level and top up if necessary with the correct oil as most modern engines are designed to use some oil to increase the lifespan of the engine. A. Generally not, most can be fitted by a trained technician in less than 20 minutes; we offer installation services for this unit at our facility and can also give you assistance over the phone if needed. A. It’s a personal choice really, both should give similar results. For some people a Tuning Box is preferable if their car is under warranty as the unit can just be removed for servicing and re-fitted afterwards. Chip tuning also gives excellent results and means that the method of tuning is invisible to the eye; one downside is that if the vehicle dealer has to install updated software from the vehicle manufacturer the chip tuning will be erased and will have to be re-done. This product comes with a 3 year product warranty, this means if the product develops a fault it will be repaired or if un-repairable it will be replaced free of charge, and the customer is responsible for return postage and insurance in the event of loss. The unit will need to be shipped directly to TMC for service, but we will provide you with assistance.